Senior official in terrorist group says Trump's decision on Jerusalem destroyed the possibility of implementing the two-state solution. 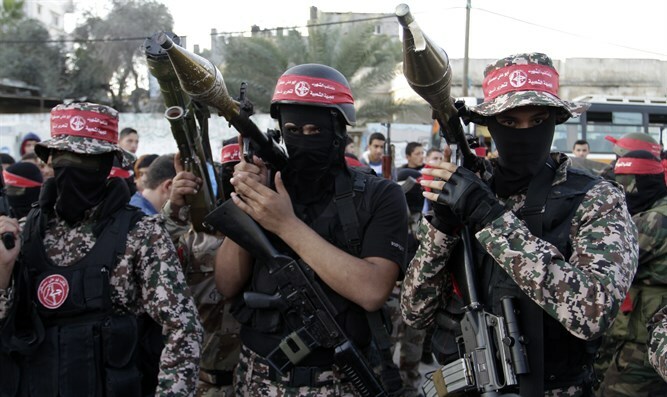 The Popular Front for the Liberation of Palestine (PFLP), a terrorist organization that is a member of the Palestine Liberation Organization (PLO), on Sunday called on the Palestinian Authority (PA) and its chairman Mahmoud Abbas to renounce the Oslo Accords, stop the security coordination with Israel and revoke the recognition of Israel, in response to U.S President Donald Trump’s announcement recognizing Jerusalem as Israel’s capital. At a mass rally in Gaza marking the 50th anniversary of the establishment of the organization, the American decision was described as a "declaration of war against the Palestinian people" and a preparation for the implementation of the “deal of the century” to settle the Palestinian-Israeli conflict at the expense of the Palestinians. Participants in the rally carried a model of the Al-Aqsa Mosque and banners reading "Al-Quds is in Danger", "Freedom to Al-Quds", "Freedom to Palestine", and "Al-Quds never belonged to Israel." Jamil Muzahir, a member of the PFLP politburo, said in his speech at the rally that Trump's decision completely destroys the possibility of implementing the two-state solution and the "illusions called the peace process."